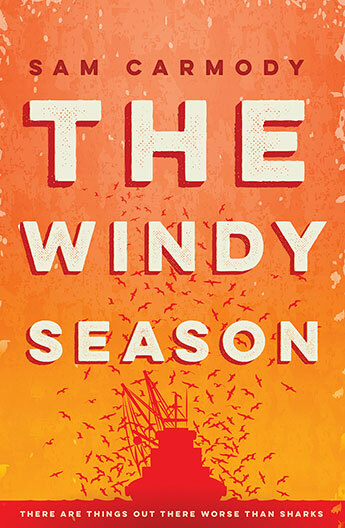 Sam Carmody’s debut novel, The Windy Season, runner up for last year’s Vogel award, takes readers deep into what has become Tim Winton territory. A dangerous coming of age story set on the wild Western Australian coast, The Windy Season plumbs the depths (literally at times) of the regional Australian experience. Seventeen year-old Paul’s brother Eliot has gone missing. Paul, is unsure how to react but wants to find Eliot and, not knowing what else to do, packs up and follows in his brother’s footsteps. Eliot had been working on his uncle’s crayfish trawler operating out the West Australian coastal town of Stark so Paul follows. At the same time as following Paul’s life, Carmody charts the journey of a group of bikies across the country. Led by The President and narrated by a character called Swiss (after the army knife), the group flee from a bust in Sydney, heading west across the desert to exact some form of unspecified revenge. Besides Paul, Carmody gives some insight into the lives of the people who drift in and out of towns like Stark. The people who work on the trawlers, those running from some aspect of their lives, and the tourists from Perth. It is a very human, sometimes light but often bleak view of these lives that encompasses some part of what could be considered a specifically Australian experience. Carmody is able to bring depth and subtlety to the town of Stark and its denizens and particularly to Paul. But this is also, at its heart, a crime novel, and Carmody keeps a firm grip on a plot that brings the two story strands of the missing brother and the bikies’ quest together cleverly. The Windy Season would have been a strong contender for the Vogels. It is a sometimes violent, sometimes dangerous, sometimes poetic and insightful debut Australian novel.